Well....it isn't a wooly fiber...but it is fibrous...cellulose (Tencel, anyone?)!!! Mr. NK is building a wooden kayak from strips of wood....Western red cedar, Northern white cedar, and an amazing Alaskan yellow cedar that has no grain...very cool stuff. Well, this was the weekend to epoxy and fiberglass the hull. Mr. NK has been reading and reading, and checking out videos of others doing the deed, and was ready to go...so, this past weekend we went. Day 2: Saturday. Fiberglass and coat 2. Mr. NK has transformed himself into a Ninja epoxy turtle man superhero, complete with a pre-cooled sweat-catcher-raggy-thingy!!! He is ready for the task at hand. We pre-heated the garage (i.e. drank coffee), applied the fiberglass, let the wrinkles straighten out (i.e. had breakfast at the local cafe), applied the epoxy (Dear Readers, your own NK was transformed into a resin weighing-mixing-pouring machine; the choreography I enlisted brought me to tears...ahem, perhaps the resin vapors seeped through the mask! ), put on this other fabric that was supposed to soak up the excess epoxy, but that didn't go so well...took it off, and squeegeed the excess off. Turned off the heat and cooled down over Will Ferrell in 'Blades of Glory' playing at the local theater...God forgive me, I laughed my arse off. Day 3: Applied another coat of epoxy. Used a foam brush to squeegee the excess. Worked pretty much like a charm. Cooled down over a Stiegl..not really, but it sounded good. Mr. NK is a grad from UP and a 'Salzburger'...if you know UP, you know what that means! A pretty nifty accomplishment for the weekend, huh? If you like what you've seen, go ahead and leave a comment if you have the inclination, it would really make Mr. NK's day!!! And we have a finished pair of socks!! Pink toes! I just can't resist the pink! 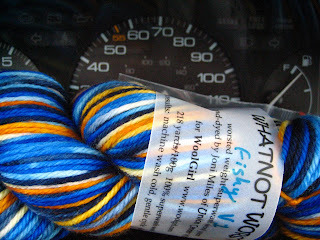 Mods: get a second job to buy more of this luscious yarn!! Happily, I could knit with an even tension knowing Sanjaya was gracing the stages of Jay, David and Ellen...aren't his 15 minutes up yet??? 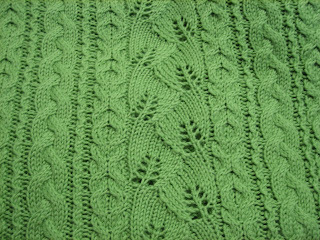 Here is a bit more detail on the baby blanket I knit for Nicole. And what have we here....? It looks like some Spunky Super Nova in 'Popsicle'! 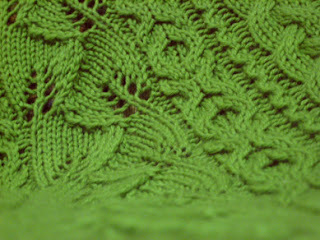 2.5 mm needles going toe up! See you at the top! Pssst: Our first Sanjaya-free week of AI is tonight!!! W.H.Y. was very busy celebrating life yesterday! Emily and Shannon are having some much needed down time from launching their new store, Twisted. Wool Girl is taking a breather to wind some yarn and start a new sock! First up, we celebrated the upcoming arrival of our friend Nicole's first baby! It was a knitterly centric party as Nicole, and many of her friends are knitters. A darling bathtime basket filled with hand knit washclothes, gentle baby soap, burp clothes, and a darling hand knit Pixie hat (Annette, you rock!). A hand knit lace hat (and booties not caught on film) knit and designed by Courtney! Awesome work C! And we had another baby blanket hand knit by Elza! Awesome work E!! This baby will be able to brave the cold in style in all these beautiful knit goodies, that's for sure!!! And we had a ton of darling cute baby items, a sampling is captured here! Best wishes Nicole!! Your little one is off to a roaring good start with all this knitted finery! 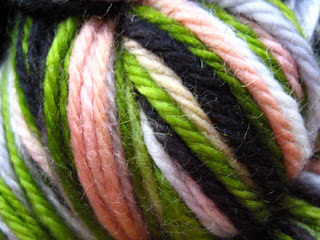 Some awesome yarn from Spunky Eclectic....note the dude in the background, he is always hanging out with his laptop...This is 2007...your LYS is the new produce aisle..you know, the place to pick up a date! Not pictured was some darling knitterly stationery and a doggie tape measure! Happy B-day Julie!! Many more happy and healthy returns!!! We heart you!! And as life cycles by their very nature are bittersweet, we want to extend our thoughts and prayers to the families and loved ones of the victims of the Virginia Tech tragedy, and to the greater community of Blacksburg, VA during this most difficult and trying time. Well, we've had some changes here at W.H.Y. First, we sadly, but excitedly, say farewell to Shannon and Emily...they are gone from the blog, but not from our fibery hearts! Shannon and Emily are following their dreams and are launching a new Yarn-Craft shop, complete with a tea bar, in the Portland area named Twisted. You can still follow their knitterly (and otherwise!) 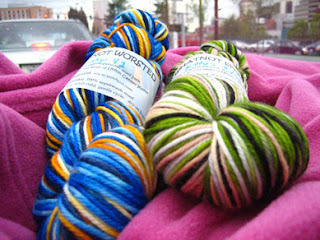 antics and shop happenings at their new blog: TwistedPdx Good Luck Shannon and Emily!! We can't wait for the grand opening!!! In other news, our own Wool Girl is following her passions, and has started an online fiber adventure! You can check out her shop at woolgirl.com. 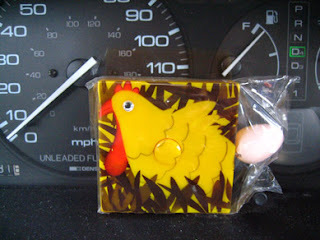 She will be blogging about her shop and her adventures with her friends Abby and Snuggles at her new blog. We here at W.H.Y. wish all of you every success and we hope all your fibery dreams come true! I work on a hill in the big city. Pill-hill to be exact. I live almost 25 miles from work, in a more rural community. The commute isn't too bad coming in to work...65 mph for the first 20 miles or so, than some congestion on the freeway and going up the hill. Coming home...DOWN said hill...a very different story. It took a whopping 30 minutes to get from the end of the driveway to the freeway entrance...maybe 1.5 miles...no more than 2. Crazy making. What did I do, you might ask? Typically I knit. 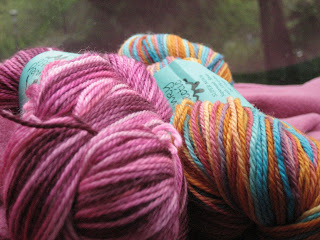 This time...I photographed skeins of yarn. A whole different level of multitasking. 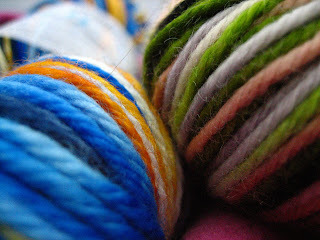 A skein of Fishy and Kitty's eyes from a new online shop...more on that later!!! AI Update: And so we lost Haley tonight...finally...I figure Sanjaya is good for another 2 weeks until we can lose Chris (gosh I want to hurl everytime he opens his mouth) and Phil....then let the games really begin!! Top 3: Melinda, Jordin, Blake (sorry Lakisha, but Blake was good tonight, you'll be back in the top 3 next week!). Bottom 3: Haley, Phil, Sanjaya (one can hope, can't they? ), but probably Chris. Simon, the traitor, who thought Sanjaya wasn't horrible...he doesn't have to say everything that he's thinking...crikey. Sanjaya's tactic (brilliant...he'll be running for office some day, I'm sure) is to wait until the other contestants who have been giving 110% week after week, and whose voices are getting tired, to finally perform in a not so horrible manner...to eek out a few more votes and last another week...hate him. No, really, hate him. My knitting was so tight tonight with Simon's crankiness against my girls (M, L and J), that I think I ended up 2 inches shorter than when I started!! Gina went home tonight, too early in my mind, but not unexpected. Phil was spared...go figure. And Haley and her "nice legs" are safe for yet another week. Sanjaya has now made it to the top 8. Crikey!! Un.Believable. Sigh. It's spring...babies and baby hats are in the air...well at least one important baby! My friend Nicole is pregnant with her first baby. Yay!! She is due in approximately 5 weeks. I can't wait to meet him or her! Congratulations Nicole and Jim!!! We have newish neighbors. They have two adorable kitties, Theo and Gigi. They come over alot, the cats that is...not the people so much. and Theo...note the paw action...manipulator to the max!